United States President Donald Trump and North Korea’s Kim Jung Un pledged on Tuesday to work towards complete denuclearization of the Korean peninsula with Washington committing to provide security guarantees for a old, longtime enemy. A unprecedented summit between the pair in Singapore started with a historic handshake, marking the first time a sitting U.S. president and a North Korean leader have met in person since the isolated Asian country went to war with South Korea. The DPRK, or Democratic People’s Republic of Korea, is the formal title for the North, a nation that spurred increasing global tensions up until late last year over its nuclear and intercontinental missile testing. The summit centred on nuclear disarmament and reducing tensions, with the agreement saying the two countries would co-operate towards “new relations” while Washington would provide “security guarantees” to Pyongyang. On nuclear weapons, Mr. Kim “reaffirmed his firm and unwavering commitment to complete denuclearization of the Korean peninsula”, but observers said the document lacked substance, in particular on how dropping nuclear weapons would be achieved. But he said sanctions would remain in place for now, and argued “we haven’t given up anything”. When the press questioned whether Trump had raised the issue of human rights with Kim, who runs a totalitarian regime with extreme censorship and forced-labour camps, the U.S. president confirmed that they had indeed broached the topic. International reaction to the Singapore summit has been reported as largely positive by global press, with the major players such as South Korea, China and Japan marking the historical significance and Trump’s leadership. China suggested on Tuesday that sanctions relief could be considered for the DPRK; Beijing, who has joined the U.S. and United Nations in tough sanctions against Pyongyang, has always maintained that tariffs should be accompanied by talks. Speaking earlier in the day, the Chinese government’s top diplomat, State Councillor Wang Yi, said China hoped the United States and the DPRK can reach agreement on a peace deal, reported Reuters news agency. Beijing, who also marked the summit as creating “new history”, is Pyongyang’s sole major ally and shares a land border with the North, and changed its tone under pressure from Trump to carry out sanctions on its authoritarian ally. South Korean President Moon Jae-in said the “two Koreas and the U.S. will write new history of peace and co-operation”, a hopeful outlook that appears to have become Seoul’s new norm since Mr. Moon has met with Kim twice earlier this year. The bilateral meetings came ahead of the Singapore summit and were significant as the two countries are still technically at war as only an armistice agreement was signed at the end of the Korean War over 60 years ago instead of permanent peace. It was the U.S. president’s “leadership and effort” that was praised by Japan’s Shinzo Abe, who also said he supports the DPRK’s pledge to denuclearize as “a step towards the comprehensive resolution of issues around North Korea”, reported the BBC. Russia warned that the “devil is in the detail” and Iran said Pyongyang should not trust Washington. The U.S. just recently pulled out from the multilateral nuclear deal with Tehran that exchanged nuclear disarmament for sanctions relief set up in 2015. Joint Statement of President Donald J. Trump of the United States of America and Chairman Kim Jong Un of the State Affairs Commission of the Democratic People’s Republic of Korea at the Singapore Summit. 2. The United States and DPRK will join their efforts to build a lasting and stable peace regime on the Korean Peninsula. 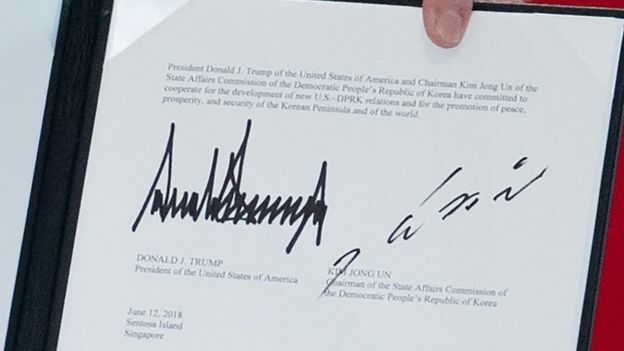 Having acknowledged that the US-DPRK summit – the first in history – was an epochal event of great significance in overcoming decades of tensions and hostilities between the two countries and for the opening up of a new future, President Trump and Chairman Kim Jong Un commit to implement the stipulations in the joint statement fully and expeditiously. The United States and the DPRK commit to hold follow-on negotiations, led by the US Secretary of State, Mike Pompeo, and a relevant high-level DPRK official, at the earliest possible date, to implement the outcomes of the US-DPRK summit. Previous PostWhat are your student leaders up to?